Synthetic rubber, squeegees, spreaders, neoprene rubber, Buna blend straight rubber, Buna blend curved rubber, EPDM rubber flat and serrated, rubber squeegees. 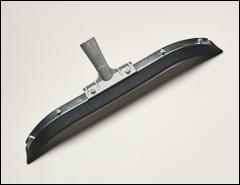 Handle sockets on squeegees shown below are designed for unthreaded, tapered end wood handles. Different spreaders are available on the Spreaders page. Please order handles separately from our Extension handles page. WARNING: Proposition 65 Label for all squeegees shown below, except following: J1520, B3300, B3301, B3302, B3303, B3304, B3305. Used for smoothing laminates and removing resin. 36" long x 3 1/2" wide x 3/8" thick with a tapered front edge. Can be cut or ground to conform to different shapes or lengths. 15/case but sold in any quantity. The blade is compatible with petroleum based materials like those used for roofing. Heavy-duty squeegee gives long service. 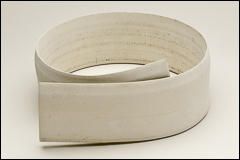 Full 3/16" thick blade is 1 1/8" wide and 12" long but can be cut down to desired width. Compatible with epoxy and urethanes. Non-marking hard gray elastomer/rubber blade spreads pigment and grit uniformly. The squeegee blade is 70 durometer which allows teeth to stand up for better control of application. Heavy-duty 14 gauge painted frame is built to last. Squeegees include frame, handle socket, and a serrated edge rubber blade. only for serrated edge squeegees. Non-marking hard gray rubber blade is 70 durometer. Heavy-duty 14 gauge painted frame is built to last. 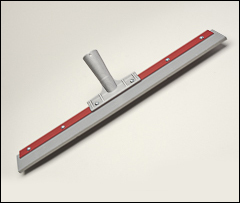 Squeegees include frame, handle socket, and a smooth edge rubber blade with no serrations. only for straight edge squeegees. 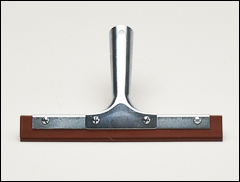 2-ply soft natural rubber window squeegee. Plated steel frame provides ideal combination of strength and economy. Squeegee provides professional results at a fraction of the cost. for squeegees listed above. Sold by the pack, 6/pack. Recommended for general maintenance. 7/32" x 2" Buna blend rubber. These straight frames have a built in scraper. Standard-duty 16 gauge plated frame. Recommended for general maintenance. 7/32" x 2" Buna blend rubber blade. Standard-duty 16 gauge plated curved frame. for either the straight or curved squeegee frames listed above. Sold by the pack, 6/pack.